Search efforts continued in a Southern California community devastated by a mudslide this week, as the number of people reported missing rose to 43, authorities said. Among the 17 killed were children ages 3, 6, 10 and 12, the Santa Barbara County Sheriff's Office said. The 17 victims were killed when a devastating mudslide occurred in the Montecito area of Santa Barbara County, early Tuesday morning after a heavy downpour struck areas burned by the huge so-called Thomas Fire that scorched hillsides last month, officials said. "This was a very sad and tragic announcement for us to make," Sheriff Bill Brown said Thursday. The number of missing fluctuated throughout the day as new reports that people couldn't be accounted for came in and as other people were found, Brown said. At one point Thursday, only seven people were reported missing, but by late Thursday afternoon, the number had risen to 43. 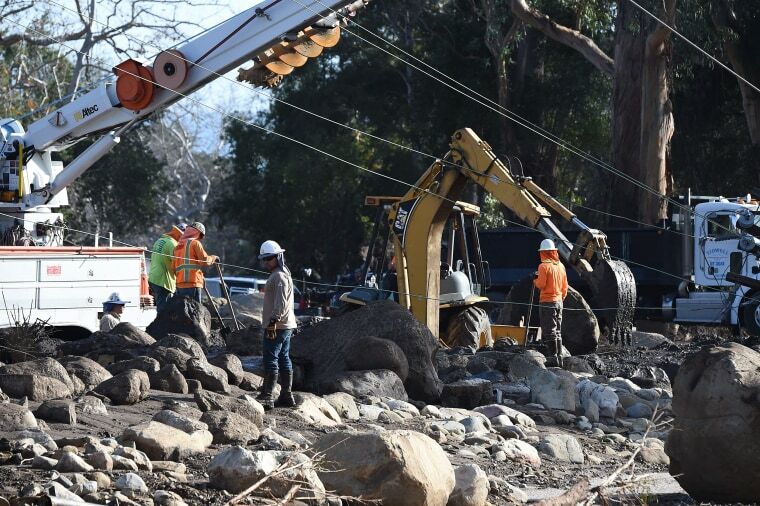 The catastrophic debris flow struck the Montecito area around 4 a.m. (7 a.m. ET) Tuesday, Montecito Fire Division Chief Kevin Taylor said. At least 65 homes were destroyed and more than 400 others were damaged, fire officials said. Among the homeowners affected by the storm was the actor Jeff Bridges, who said on Twitter that his home was "severely damaged." "But we are safe, and so thankful for that and for the first responders who are working tirelessly to save people," he said. "We are heartbroken over the loss of lives in our community." Oprah Winfrey posted video on Instagram this week showing debris from the mudslide by her property, saying a fence was destroyed. She said that her property was fine and that the damage "pales in comparison" to what her neighbors were going through. The mudslide ruptured a gas line and caused some fires, fire officials said. Greg Tebbe of Montecito described being worried about the coming rain when he went to bed Monday night, but he said he didn't expect the mudslide. The rain really started coming down around 3 a.m., he said, and then the sky lit up from a "huge fireball" up the mountain, he said. "I started hearing this roar right after I saw the fireball. And then I started seeing debris rolling by my house. Like, in the dark I could see boulders all the sudden go by at enormous speed," Tebbe said Wednesday. "That's when I immediately bolted for the wall, to try and hide behind a wall — not knowing how big this wall of mud is going to be. Was it going to take out my entire house?" he said. His house was spared and was right on the edge of the river that developed, he said. More than 3 inches of rain fell in parts of Santa Barbara during Tuesday's downpour, but it was the speed of the rainfall that caused mudslides, according to the National Weather Service. The Carpinteria Fire Department recorded a half-inch of rain in just 5 minutes Tuesday morning, officials said. Santa Barbara County Sheriff Bill Brown said the devastation left by the mudslide, which swept boulders, downed trees, cars and power lines in its path, "looked like a World War I battlefield." Nearly 700 fire and other personnel and 14 helicopters were assisting in the recovery efforts, the fire department said.